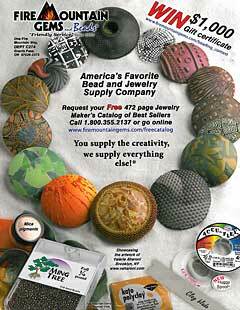 Chris and Valerie showing the Bead Star magazine cover (featuring Valerie's winning piece) and Fire Mountain Gems and Beads Back Cover Advertisement, featuring other designs of Valerie's below. 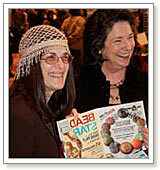 Bead Star's 2008 Best in Show designer, Valerie Aharoni, was completely shocked about winning. It's the first time she has ever won anything--as well as her first time entering a beading contest. 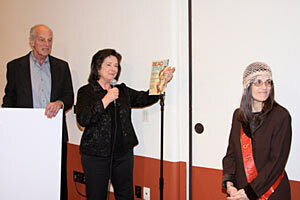 Chris and Stuart Freedman introducing Bead Star Winner Valerie Aharoni. 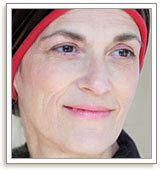 Valerie began beading in 2006 as a way to complement her polymer clay artwork. 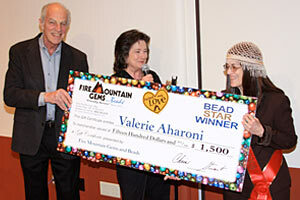 After a few years of making jewelry, Valerie decided to enter the Bead Star 2008 contest. She submitted her seed bead and polymer clay piece, ''Gild and reGild'', with the confidence that she loved the design, no matter what anyone else thought. As it turns out, jewelry-makers worldwide loved her piece as well and selected her design as the first-place winner for the Seed Bead Category. 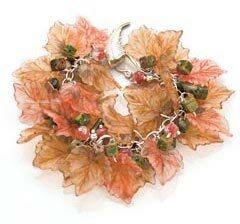 Fire Mountain Gems and Beads, the Grand Prize sponsor, selected ''Gild and reGild'' (shown below) as the Best in Show. As the Best in Show winner, Valerie won an all-expense-paid-trip for two to Interweave's Bead Fest Santa Fe, March 12-15, 2009, where she was awarded a $1,500 Fire Mountain Gems and Beads gift certificate, personally presented by the owners, Chris and Stuart Freedman. 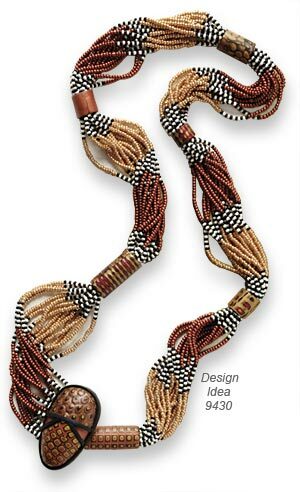 Valerie's winning piece was featured on the cover of the Bead Star 2008 magazine, an annual Interweave publication showcasing prize-winning jewelry designs selected by beaders worldwide. A grouping of her lentil bead designs also appeared on the back cover, as part of a Fire Mountain Gems and Beads' advertisement. Valerie Aharoni was raised in the mid-west, where the energy of the 60's era greatly influenced her creatively. She brings her fascination with form and color to her art. For more than twenty years, Valerie has been designing with polymer clay, creating intricate, three-dimensional ''paintings'' and sculptures. Only recently did she begin joining her clay artwork with jewelry design. Valerie's recent jewelry designs combine polymer clay with seed beads and small faceted gems. Visualizing her past travels, she recreates her experiences for others to see in each of her designs. In addition to being featured on a Fire Mountain Gems and Beads back cover advertisement in Bead Star magazine and winning Bead Star's Best in Show, Valerie has a website, www.vaharoni.com, and blog in which she shares her experiences and ideas with the creative community. She also sells jewelry and polymer clay beads at VAharoni.etsy.com. View all of Valerie's designs in the Gallery of Designs. Valerie Aharoni longs to live a life of solitude surrounded by beads, fiber, and nature. Current residences include www.valerieaharoni.com and www.vaharoni.com.